Aussie jean empire Saint has gone from making the world’s strongest jeans to becoming one of Australia’s biggest denim brand names thanks to their cult tech innovation. It was an extraordinary innovation in a tech lab one day that led to Saint’s now revered product. While building his other athletic apparel brand, 2XU, Saint’s co-founder Aidan Clarke came across a material so durable that it is commonly used to tether spaceships. It was the discovery of this incredible innovation after a long search, ending with an abandoned French project that saw Saint redevelop the fabric with an innovative Italian mill, that led to the creation of the Melbourne based denim empire now called Saint. 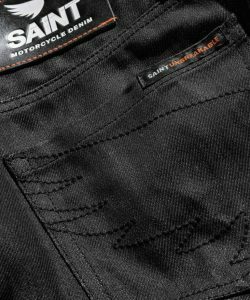 Initially targeting a niche market of motorbike rider boasting the world’s strongest single layer denim, up to 200 times stronger than regular denim, Saint has now branched out to a broader audience. But before stemming out, Mr Clarke said it was a gap in the market that initially sparked the brand’s creation. 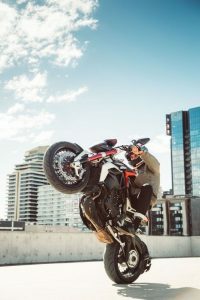 “This idea came from our own experience of riding motorbikes, but being uncomfortable off the bike – not to mention looking like a storm trooper. Existing solutions involved multiple layers and often very dated blocks and designs. 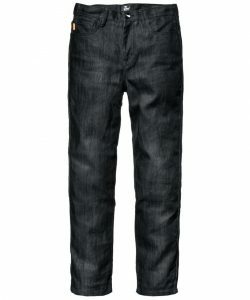 Not sure that anyone was asking for single layer safety denims, but our answer discovered a demand!,” he said. It was Mr Clarke’s experience working with durable fabrics at 2XU that helped to inform his interest in using fabric innovation to create products that meet customer needs and ultimately, led to the foundational ethos of Saint. “2XU and SA1NT are very different brands, but share this same fabric innovation and functional product philosophy,” he said. 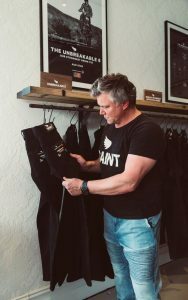 Having met widespread success in its niche market offering jeans tailored for motorbike riders – tough, stretchy and comfortable – Saint decided to branch out to a broader audience and now offers a wide range of casual products, including denim jackets, and is a high-demand retailer. “In delivering the first moto collection we were surprised how many customers were buying the garments for off the bike use. From bouncers to tradies, they were prepared to pay high moto prices for the functionality. It was a logical progression to produce a more appropriate price point and strength for these tough applications that don’t need to slide down the road for 5.9 seconds – like our moto product does,” he said. Having expanded out to a general market, including women’s tough denim-wear, it’s their female fans that are driving the brand’s growth. It was these inroads in Aussie jean products that has led to global success for the company, with strong online and international sales powered by social media. But despite the skyrocketing sales led by e-commerce, the brand still believes strongly in brick and mortar approach. “We believe brick doesn’t need to be fully replaced with click. There’s a place to for experiential stores, where customers can see and feel the new innovations. We have a display in store that shows just how tough our denims are, and a collection of motorbikes sends the waft of oil through the room like a garage. There’s elements in a physical store that augment the experience available online,” he said. The Saint jeans at play on a motorbike ride. Either way, for Saint it’s the value of fabric innovation that is bound to continue to make retailers stand out amongst the rest as consumer demand for durable fabrics grows. But for Saint, the success story doesn’t stop here. The denim guru has its eyes on the horizon, now working on plans to become a household name around the globe. “We want this brand to be household, for everyone to know what they are missing out on! There are so many opportunities with new fabrics, accessories like bags, ranges that are more fashion and street, and just new styles and silhouettes that we haven’t produced yet in Works and Moto. We are very excited about the future,” he said.